I am an enthusiastic advocate of Sunday lunch. In my youth, it was one of the most popular of British institutions, into the celebration of which many a hostess and many a chef would put long hours and much effort. Now, at least in Britain, it seems to have fallen out of favour, and that cursed hybrid ‘brunch’ is polluting the Sabbath. So, when I tell you that I have just had one of the most enjoyable Sunday lunches of my life, perhaps you will not be surprised to learn that it was in Paris. To be precise, it was within the portals of that icon of Parisian luxury – the Hotel Meurice. 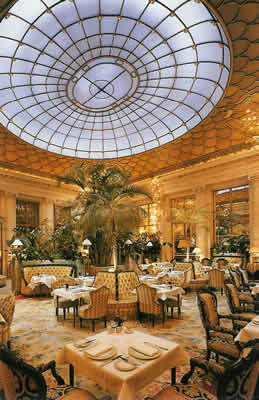 I have known the Meurice for two decades, at least. For most of that time, it was the sleeping giant among the hotels of the French capital. Indeed, years ago I used to slip – quite unnoticed – into what was then the hotel’s ‘back door’ on the rue de Rivoli, to seek out a sofa in the Salon de Pompadour. There I would enjoy the quietest afternoon tea in Paris. For the Meurice’s sumptuous public rooms – dating from 1907, but modelled on the ravishing interiors of Versailles – were frequently empty. They were also – it has to be admitted – ever so slightly faded. Then came a massive (and massively expensive) restoration, and the crowds began to flock back – to be seduced once more by the gilt, the crystal, the marble and the mosaic of this gorgeous building. On my way to tea in former times, I would cross a large chamber. Around its walls were fluted Corinthian columns. Its floor comprised an exquisite mosaic of delicate garlands. Apart from two impressive statues of athletes – copied, I supposed, from those of Classical antiquity – it was completely devoid of furniture. I used to like this room. But it was certainly not a place in which one paused. Now a remarkable transformation has occurred. It has become the Jardin d’Hiver. Overhead there is a glass and metal ceiling, of which a resurrected Monsieur Eiffel might be proud. Leaves of potted palms sway gently to and fro. Warm colours in profusion spring from the upholstery of fauteuils and banquettes. Waiters and waitresses in black uniforms glide this way and that among tables covered by off-white damask. Conversation buzzes among the affluent and well-dressed customers. Jolly canned music bounces about in the background. This is the Winter Garden to which, on a bright Sunday, I had come to lunch. As I settled at my corner table, my expectations were high. Although Chef Yannick Alleno’s two Michelin stars are for the dishes he presents in the Restaurant Le Meurice (which is closed for lunch on Sundays), I knew that he was responsible also for the food served at the Jardin d’Hiver. It would, I thought, be simpler but of an excellent standard. And I was absolutely right. If you like ingredients of the highest quality, prepared straightforwardly with the utmost expertise and skill and combined with intelligence and flair, this is the place for you. I loved it. And my drinking was spiffing, too. The list comprises just 24 French offerings, ranging in price from a still rosé at 30 euros to the Lanson rosé champagne at 130 euros. I decided to choose burgundy for both my white and my red, and to stay with that excellent producer, J-M. Boillot. His 2003 Puligny Montrachet (65 euros, half) had the qualities I love in really good white burgundy: toast in the nose, cream in the mouth and a structure both elegant and caressing. His 2000 Volnay (108 euros) had soft red fruit and a gloriously excremental nose. This splendid meal strengthened my enthusiasm for Sunday lunch, which – if you have it at the Jardin d’Hiver – can still be the highlight of the week. It has also whetted my appetite for more experience of the restored Hotel Meurice, which I suspect is now a very good hotel indeed. 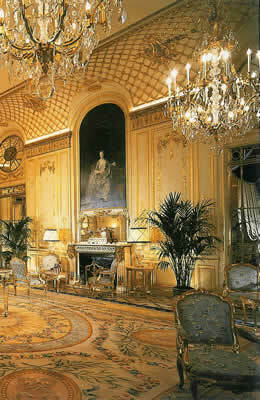 Hotel Meurice, 228 rue de Rivoli, 75001 Paris, France. Breakfast, lunch, tea and dinner daily.